Firstly, read these key words: 2.4-GHz and 5-GHz mode, Dual 5-GHz mode, Cisco DNA Assurance network sensor. Who is it? The new and the smartest Aironet 4800 AP it is. 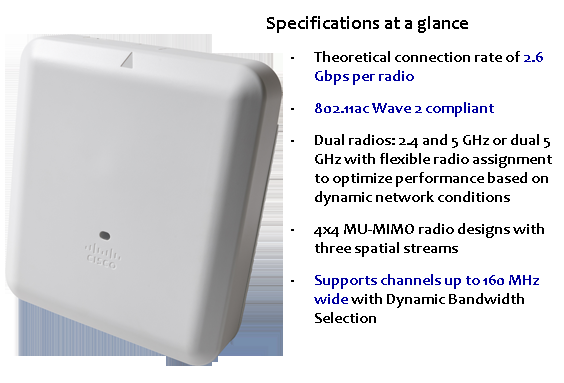 The latest Cisco Aironet 4800 Access Point is the richest featured 802.11ac Wave 2 AP and provides Intelligent Capture, high-speed connectivity and innovative security that strengthens your network. The Aironet 4800 makes trouble-shooting simpler and enhances context shown in DNA Center Assurance. The built-in Intelligent Capture provides enhanced issue detection and root cause analysis, on-demand, real-time troubleshooting and in-service AP monitoring with packet capture. What that means is Intelligent Capture will probe your network, provide DNA Center Assurance with deep data analysis and it’s easier for you to fix the problem—that is unless the network hasn’t done it, itself. Whenever you get a call about a problem, the person reporting the call almost always assumes that it’s a network issue and we both know that’s often not the case. The data garnered from Intelligent Capture can prove that it’s not a networking issue by showing you exactly where the issue is coming from. That way you can go and find that needle in that haystack in record time. And with client monitoring, Intelligent Capture monitors more than 240 of the most common onboarding anomalies and can automatically remediate certain issues. The on-demand Wi-Fi App analytics makes use of the third radio on the Aironet 4800 access point which allows for instant insights. A Spectrum Analyzer, also offered through Intelligent Capture, is now available to customers without a third-party license. It’s not just the Intelligent Capture that makes the Aironet 4800 an amazing cutting-edge access point. The 4800 has all of the terrific Aironet features such as Flexible Radio Assignment, high accuracy embedded Hyperlocation and Bluetooth Low Energy provided over four dedicated radios. With these features running on the radios embedded in the 4800 AP, your network allows for higher security and data analysis without degrading performance. You’ve been asking for it and we’ve heard you, finally a follow-on to our popular Hyperlocation module. Except that instead of a separate module that plugs into your access point, we’ve dedicated an integrated radio for embedded Hyperlocation. This provides more granular data, by enabling device monitoring and tracking to within three meters—the best in the industry. Hyperlocation can help your employees and guests find their way through your building with the App-enabled “Indoor Wayfinding and Navigation” features. There is also a separate radio for Bluetooth Low Energy, which uses proximity technology to enhance location services for mobile devices. 2.4-GHz and 5-GHz mode: One radio serves clients in 2.4-GHz mode, while the other serves clients in 5-GHz mode. Dual 5-GHz mode: Both radios inside the access point operate on the 5-GHz band, maximizing the benefits of 802.11ac Wave 2 and increasing client device capacity. When it comes to security, you can bet that the Cisco Aironet 4800 Access Point has been designed to stop any rogue agents trying to gain access to your network. And with one radio dedicated to security 24/7, the 4800 is constantly monitoring the network will locate the small problems that can mushroom into catastrophes. This best-in-class, high density 4800 access point will redefine analytics and location. Choose the best Cisco access point or Wireless LAN controller for you. 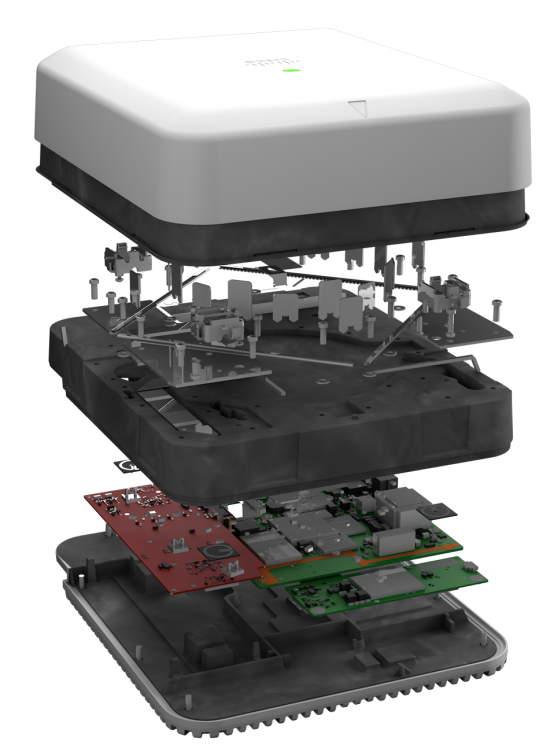 What’s Inside the Cisco Wireless Solution?